This black friday price tracker offers you a great eCommerce advantage. Use Shopify coupons 2017 to make your competitor price tracking a success! 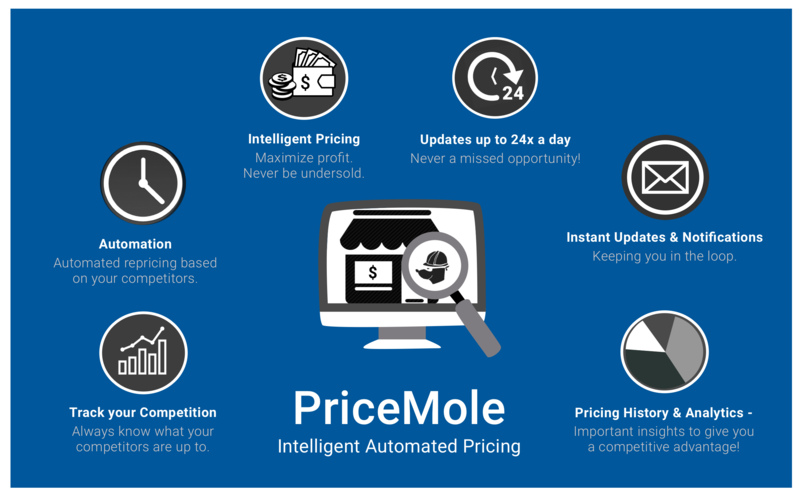 PriceMole is now available on Shopify: An easy-to-use price tracking solution for Retailers & Brands. You can now turn competitive pricing into an opportunity. With PriceMole you always know what your competitors are up to. Notification alerts and reports will keep you informed of any changes to prices you are tracking. Pricing strategies will automate your response and keep your prices competitive. Initially the app required you to start the tracking process by hitting track. Then you could start adding your competitor URL's and keep an eye on them. We have eliminated the extra step of starting the tracking process by automating it for you. Now you can just add your competitors and the app starts the process automatically. Yeah Automation! In the earlier version of the app, you needed to set up a pricing stratgey for each product individually. Now you can create a pricing stratgey, save it in the library and apply it to individual products, groups of products or even all your products, saving you loads of valuable time. Setting up a strategy is very simple and straightforward with easy dropdown menus to choose from matching, being higher or lower than your cheapest, most expensive or average competitor. But now you can add some customization to yous strategies. Decide if you want to be $10 higher than your average competitor, or if you would like to be 5% lower than the most expensive competitor, it's up to you! It is now possible to add the cost of your product to the application. This allows you to check the difference between your sale price and what you initially paid. In pricing strategies, you can choose to never have your price drop lower than your cost, so you never worry about losing a dime again! You can now not only search by product name, but by competitor, competitor URL, by tracked and untracked products and by price strategy, allowing you quick and easy access to individual as well as groups of products. We are focused on delivering the ability to track your competitors stock and have a currency aware application within the next few weeks. Want to learn more? Contact us or check out PriceMole Shopify today. Stay tuned for more development updates!